BigChange’s three-in-one solution is delivering a paperless revolution for users and combines a cloud-based Job Planning, Scheduling & CRM back-office, Android mobile app running on rugged Samsung tablets and hard-wired or app based live tracking of vehicles and resources. Industry specific versions of the JobWatch system have been implemented by Sutton & East Surrey Water PLC, Sheffield Council, Smart Metering specialist Providor part of Lakehouse PLC, Hewer Facilities Management, The McDougall Group, Woods Building Maintenance and 2015 BBC Apprentice winner ImpraGas. Mobile engineers and technicians benefit from an easy to use Android mobile app that replaces all paper job-cards, risk assessments and method statements. Technicians start their day by completing an electronic timesheet and vehicle check, before instantly accessing the day’s work orders. Integrated sat-nav with live traffic ensures the best route is taken and customers receive proactive ETA (Estimated Time of Arrival) alerts by text and email. On arrival, the JobWatch app guides technicians step by step through job-specific workflows and captures essential information such as site-photos or test readings. Users can search for parts and add them instantly to the job. Proof-of-service and customer signature is captured and synced with the back-office instantly. The system generates invoices, custom reports, certificates, legal documents and fully branded job-cards that are automatically shared via a customer’s booking portal or email. This paperless approach is saving BigChange customers hundreds of thousands of pieces of paper annually, along with the manual back-office administration that was required to manually process these documents. 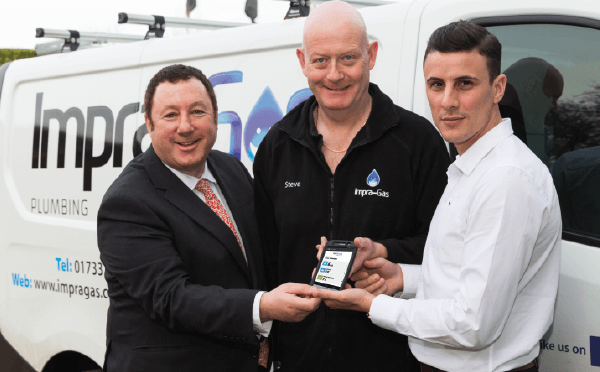 The BigChange JobWatch system is also delivering superior value for Heating, Gas, Electric and Home Automation businesses such as ImpraGas, founded by 2015 BBC Apprentice Winner Joseph Valente and owned 50/50 with Lord Sugar. The company is on a mission to revolutionise the plumbing industry, using the BigChange platform to offer customers a faster, improved service. The technology is not only managing the entire operation all the way from quotation to invoice but is also ensuring consistent service quality and compliance. Gas Safety inspections are completed on the app and stored and shared electronically with customers and landlords. BigChange JobWatch is enabling service innovations such as real-time booking on the company’s website as well as a fully-branded ImpraGas mobile booking and payments app.